Booking: The Cellobserver microscope can be booked via the webcalender and is only available for trained users. For first time-users contact Ronald Breedijk (+7860). 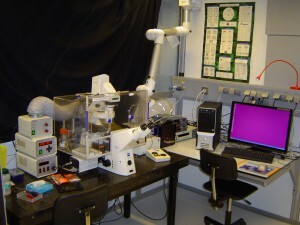 Description: This Zeiss widefield microscope is equiped with a lamp and 37oC incubation chamber, making it suited for multi-color experiments possibly combined with long term measurements Excitation: Cairn Xenon Arc lamp in combination with a computer controlled monochromator (bandwidth: 0.30 nm).